Objectives The Spanish government has strengthened tobacco control policies since 2005, including changes in tobacco taxes. Because these changes have targeted cigarettes mainly, the tobacco industry has marketed cheaper alternative tobacco products, offering smokers the possibility to downtrade. This paper traces the evolution of patterns of demand for cigarettes and other tobacco products in Spain over the period 2005–2011 in order to assess the impact of such tax loopholes. Methods The authors use data on tobacco products prices and sales as well as changes in the structure and levels of tobacco taxes to relate tax changes to price changes and subsequent market share changes. Results Tax reforms have lifted the bottom end of the cigarette price distribution, but the industry has been successful in marketing fine-cut tobacco at cheap prices. There have been partial attempts to correct this asymmetric tax treatment, but these have not avoided a remarkable increase in the market share of fine-cut tobacco. The absence of a minimum tax on quantity for the rest of tobacco products allows the industry to place them as potential future downtrading vehicles. Conclusions In order to address public health objectives, tax policies should aim to equalise the cost of smoking across different tobacco products. Otherwise the tobacco industry can exploit tax loopholes to market cheap alternatives to cigarettes. This requires all tobacco products to bear a minimum tax on quantity, whose levels need to be adjusted in order to reflect the equivalence between different forms of smoking. Spain has gone a long way in applying tobacco control policies over the last 5 years. A complete ban on advertising and sponsorship and a smoking ban at workplaces other than bars and restaurants in 20061 were followed by several tax reforms and an extension of the ban to bars and restaurants at the start of 2011.2 While some studies have addressed the effects of the first set of clean air measures,3–8 less attention has been paid to the concomitant fiscal changes and the transformations of the tobacco market that they set in motion. Within the boundaries of the European tobacco tax Directives, which require a mixed excise system comprising both specific and ad valorem taxes, Spain had traditionally relied on ad valorem taxes (a percentage tax based on the monetary value of the product) in detriment of specific taxes (fixed taxes based on the quantity of the product). This aimed to protect cheap domestic brands, which under a predominantly ad valorem system can be marketed at a discount, against foreign premium brands. The complete advertising and sponsorship ban in 2006 (a previous ban affecting only public media was passed in 1988) changed the long sustained status quo by reducing competition between tobacco suppliers to the price dimension. This triggered the flooding of the cigarette market with discount brands, to which suppliers of premium brands such as Altria (Phillip Morris) responded by asking for the application of a minimum tax per quantity and engaging in a price war as a way to put pressure on the government.9 The Spanish government reacted by introducing a minimum tax of €55 per 1000 cigarettes in February 2006. This minimum tax on the quantity of cigarettes was subsequently increased to €70 in November 2006, €91.3 in June 2009 and €116.9 in December 2010 (see table 1). However, other tobacco products (cigars and cigarillos, pipe tobacco and fine-cut tobacco used to hand roll cigarettes) remained taxed on an ad valorem basis alone until June 2009, when a minimum tax of €50/kg was implemented on fine-cut tobacco, a figure revised upwards to €75/kg in December 2010. Pipe tobacco and cigars and cigarillos only bear ad valorem taxes at the time of writing this article (November 2011). 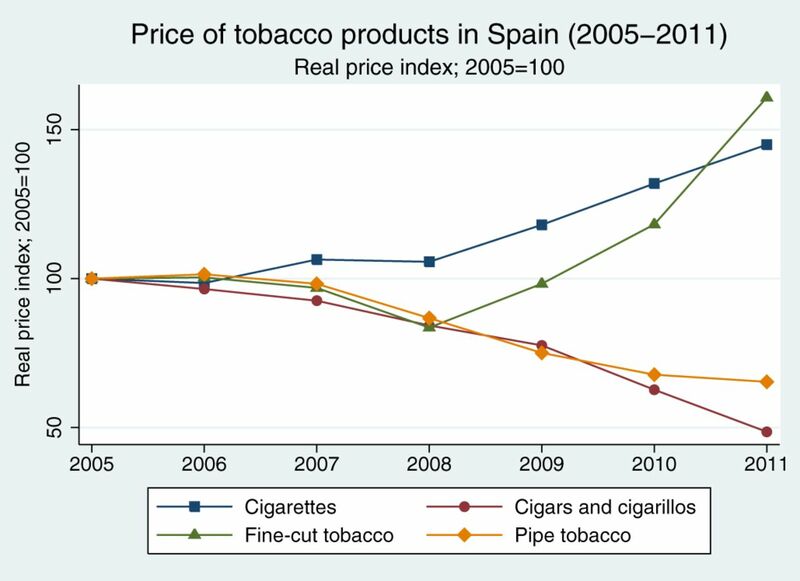 With a view to evaluating the public health implications of the tax policies described above, we analyse the tobacco market in Spain over the period 2005–2011. We focus on the cost of the various tobacco products and on the shifting patterns of tobacco demand to identify loopholes that have hampered the public health effectiveness of tobacco taxation. Since other EU countries are also required to implement tax structures and levels that comply with EU tobacco tax directives, we are able to draw implications of both domestic and international interest. We analyse publicly available data on tobacco products sales and prices from Comisionado para el Mercado de Tabacos,10 a public agency (formally dependent of the Ministry of Finance) in charge of regulating the supply of tobacco products in Spain. We use official price indices published by the Instituto Nacional de Estadística 11 to account for the effects of inflation. We relate changes in the structure and levels for tobacco taxes, which are published in the Boletín Oficial del Estado,12 to shifts in the distribution of cigarette prices over time and to the evolution of the relative prices and the market shares of the four main tobacco products in the Spanish market: cigarettes, cigars and cigarillos (data for which are available only as a composite category), fine-cut tobacco and pipe tobacco. We abstract from issues related to illegal tobacco products on the basis of recent evidence13 showing that the share of counterfeit and contraband cigarettes in the Spanish market has remained stable at 2.4%–2.5% between 2006 and 2010. This suggests that the tax changes described in the paper have not had an impact on the size of the illegal market. Since the reforms described above sought to put an end to the proliferation of cheap cigarettes, we first examine the evolution of the distribution of cigarette prices in real terms (at 2011 constant prices). It is important to stress that the success of the introduction of a minimum tax has to be gauged by its effect on the lower end of the price distribution, so looking at average or median prices is frequently not informative enough. Figure 1 shows that the lower end of the cigarette price spectrum became cheaper between 2003 and 2005. By early 2006, it was possible to buy a pack of 20 cigarettes for little more than €1 (at 2011 prices). 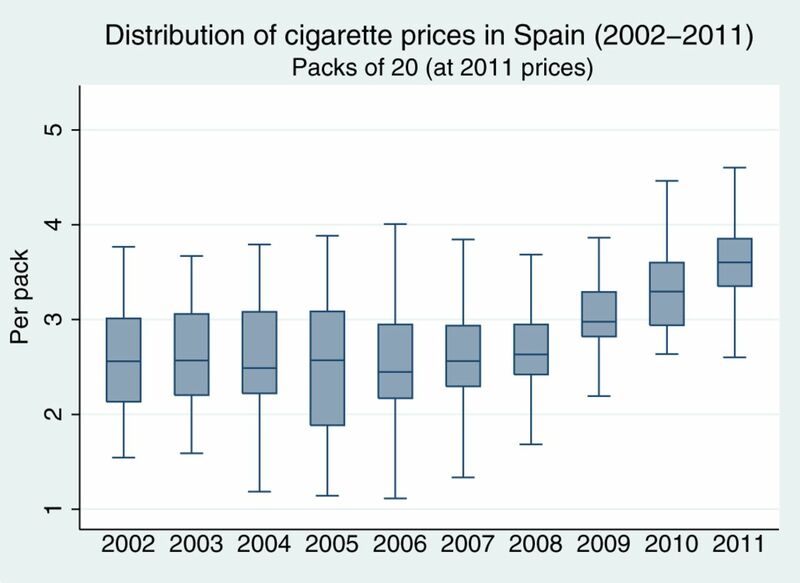 Moreover, the average price paid by smokers fell from €2.59 per pack in 2004 to €2.50 in 2006 (both figures at 2011 prices). But the introduction of the minimum tax of €55 per 1000 cigarettes in 2006 and its subsequent hikes have effectively lifted the bottom end and compressed the cigarette price distribution. Cigarette prices measured in euros per pack of 20 units (at 2011 constant prices). Data for 1 December every year over 2002–2010 and 1 May 2011. Boxes represent the lower and upper quartiles (25th and 75th percentiles) of the distributions, middle bars represent the median and whiskers represent the lowest/highest values within 1.5 times the IQR below/above the lower/upper quartile. As mentioned earlier, the 2006 tax reform only applied to manufactured cigarettes. This granted tobacco suppliers the possibility of supplying other tobacco products at low prices. Such a response from the tobacco industry could have been expected since it is well known that downtrading from cigarettes to other tobacco products when taxes on the former are hiked has occurred elsewhere.14 Figure 2 presents the evolution of a real price index for the four tobacco products since 2005. Note that, up to 2008, fine-cut tobacco, cigars and cigarillos and pipe tobacco were getting cheaper. The introduction of a minimum tax of €50/kg of fine-cut tobacco in 2009 and its subsequent upwards revisions reversed the trend on its price. However, the price of cigars and cigarillos and pipe tobacco, on which no minimum tax have been implemented, have continued to fall up until the end of the study period. Evolution of real price indices of cigarettes, cigars and cigarillos, fine-cut tobacco and pipe tobacco 2005–2011 (2005=100). Figure 2 offers, however, only part of the picture since it represents the evolution of the prices with reference to their own starting level in 2005. To complete the view, we need to examine the absolute differences in prices across the products. Here, we focus on the three products that can be easily compared in terms of ‘packs of 20 cigarette equivalents’. We assume that one hand-rolled cigarette takes 0.7 g15 and that, only for the purposes of this comparison, one cigar or cigarillo is equivalent to one cigarette. Since no obvious conversion assumption is available for pipe tobacco, we leave it out of the comparison. As we show in figure 3, throughout the study period, the most expensive product category is cigars and cigarillos, whereas the cheapest is fine-cut tobacco for hand-rolled cigarettes. There is a remarkable gap between manufactured cigarettes and hand-rolled cigarettes, the latter costing about 50% less than the former. This gap remains unaltered even after the minimum quantity tax on fine-cut tobacco introduced in 2009. In fact, figure 3 shows that this tax did not prompt the equalisation of the cost of manufactured and hand-rolled cigarettes. On the contrary, the gap between cigarettes and cigars and cigarillos nearly closed towards the end of the study period. 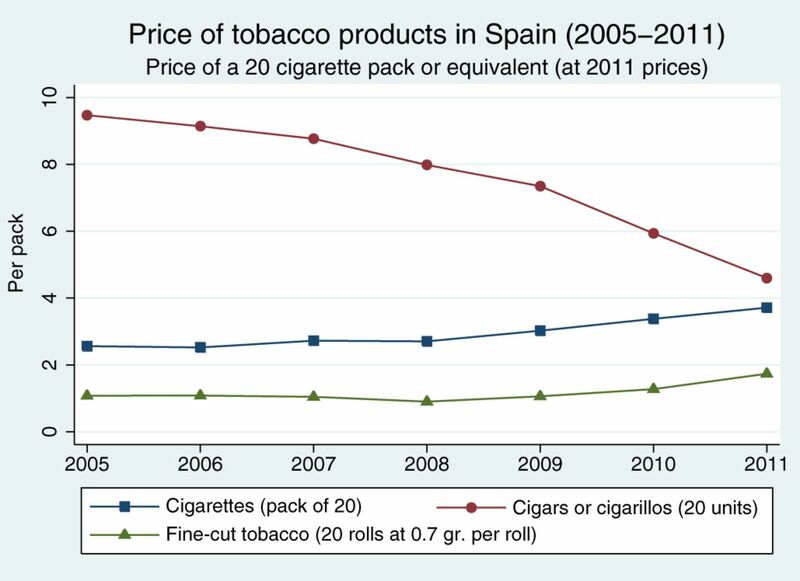 Evolution of prices of tobacco products (pack of 20 cigarettes, 20 rolls using 0.7 g of fine-cut tobacco and 20 cigars and cigarillos) 2005–2011 (2011 constant prices). While cigarettes (representing 91.1% of sales) take by far the largest share of the market, the share of fine-cut tobacco has more than trebled (from 1.6% to 5.1% of sales) since 2005 (figure 4). The share of cigars and cigarillos has slightly decreased (from 4.1% to 3.3% of sales) and that of pipe tobacco has remained marginal (at <0.5% of sales). The increase in the share of fine-cut tobacco is mirrored by a drop in the share of cigarettes. 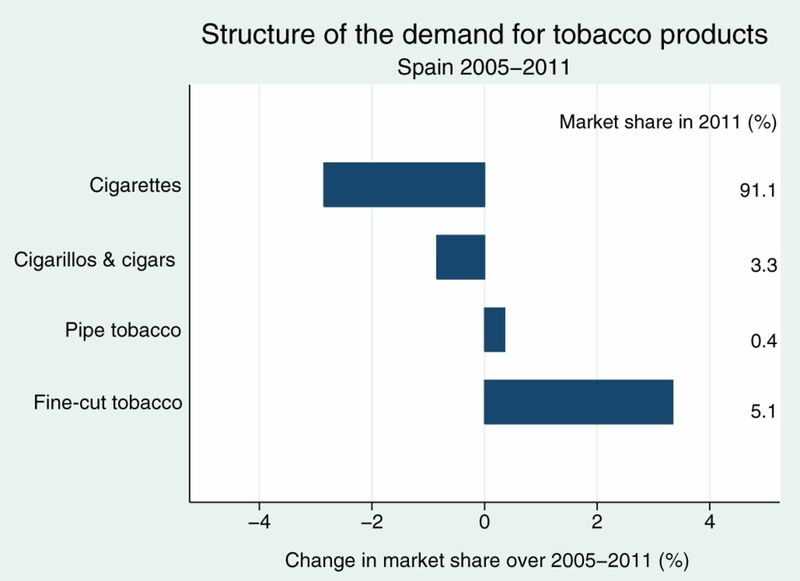 Evolution of the market shares of tobacco products 2005–2011. The introduction of the minimum tax of €55 per 1000 cigarettes in 2006 and its subsequent hikes effectively lifted the bottom end and compressed the cigarette price distribution reducing the possibilities for downtrading to cheap cigarette brands. It is not clear to what extent these reforms were influenced by the lobbying of firms such as Altria,9 which have been reported to promote the application of fully specific tax structures in other European markets in order to benefit their product portfolio.16 In any case, a better conceived tax package would have avoided an important loophole that the tobacco industry has subsequently been able to exploit. Fine-cut tobacco bore no minimum tax on quantity until 2009, and the level of such tax has not sufficed to close the price gap between manufactured and hand-rolled cigarettes up to date. As a result, the market share of fine-cut tobacco has increased and now surpasses 5% of sales, and it is expected to grow further. The availability of a cheap alternative over a period when cigarettes were becoming dearer may have deterred price sensitive smokers from quitting. In fact, smoking prevalence in adults has barely changed between 2006 (26.4%)17 and 2009 (26.2%),18 the latest year for which comparable data are available. A clear policy recommendation emerges from these facts: the tax burden between cigarettes and fine-cut tobacco should not create an incentive towards downtrading from manufactured to hand-rolled cigarettes. On the assumption that rolling one cigarette takes 0.7 g, the minimum tax on fine-cut tobacco should be increased to €167/kg (but equivalency rates as low as 0.45 g per cigarette have been reported in some studies19 so this figure of €167/kg must be interpreted as a lower bound on the necessary adjustment). Otherwise, the effects on the propensity to quit smoking (or to refrain from starting to smoke) of any cigarette tax increase will be diluted as price sensitive consumers take up hand-rolled cigarettes. With the appropriate adjustments in levels, this recommendation can be extended to all the EU member states since the price gap in favour of fine-cut tobacco is pervasive across the region. This first loophole is to a great extent a result of having applied an asymmetric tax structure across fine-cut tobacco and cigarettes over a crucial 3-year period (2006–2009), during which fine-cut tobacco bore no minimum tax on quantity. Likewise, there is a second loophole created by the absence of a minimum tax on quantity for cigars and cigarillos. The fall in the cost of smoking cigars or cigarillos, fast approaching that of smoking cigarettes, suggests that the tobacco industry is ready to exploit the tax differential to place cigars and cigarillos as another downtrading vehicle. The policy recommendation in this case consists in applying a minimum tax on quantity, either on a per unit or a per weight basis (or even both, given the heterogeneity of cigar and cigarillo varieties). The example of the French stance in this regard (a minimum tax of €89 per kg) is an interesting benchmark, but the cases of Austria or Belgium (applying, respectively, minimum taxes of €40 and €64 per 1000 units) are worth considering. In any case, the tax should be modulated to confer no price advantage to any product. Again, the recommendation of applying a minimum tax on quantity for cigars and cigarillos applies to several EU member states (Greece, Finland, Italy, Hungary, Latvia, Netherlands, Portugal and Slovenia) that, along with Spain, have not started to close this loophole yet. Up to date (November 2011), there are several tobacco products that, like pipe tobacco, capture a negligible share in the Spanish market: chewing tobacco, inhaling tobacco and ‘blunts’ (a variety of cigars). None of these products bears a minimum per quantity tax. They all could at some point in the future become downtrading vehicles for price sensitive smokers, much in the same fashion as fine-cut tobacco has been recently. The alignment of fiscal policy with the commitments of the Framework Convention on Tobacco Control would recommend prompt action from the tax authorities. In conclusion, tax policies in Spain and EU member states should aim to equalise the cost of consuming tobacco across different products. Otherwise, the tobacco industry can exploit the resulting tax loopholes to market cheap alternatives. This requires all products to bear a minimum tax on quantity, with levels adjusted in order to reflect the equivalence between different forms of consumption. This paper identifies important loopholes in the taxation of cigarette products and illustrates their consequences for the Spanish tobacco market. The loopholes originate from applying a minimum tax on quantity only on cigarettes rather than on all tobacco products. It shows that these loopholes have permitted the marketing of cheap alternatives to cigarettes and proposes corrective measures.
. Spain: going smoke-free. Tob Control 2006;15:80–1.
. Spain: beyond the 'Spanish model' to a total ban. Tob Control 2011;20:6–7.
. Study of the impact of laws regulating tobacco consumption on the prevalence of passive smoking in Spain. Eur J Public Health 2008;18:622–5.
. Impact of the “Tobacco control law” on exposure to environmental tobacco smoke in Spain. BMC Public Health 2007;7:224.
. Impact of the Spanish smoking law on exposure to secondhand smoke in offices and hospitality venues: before and after study. Environ Health Perspect 2009;117:344–7.
. Impact of the Spanish smoking control law on exposure to second-hand smoke and respiratory health in hospitality workers: a cohort study. PloS One 2009;4:e4244.
. Smoking in the hospitality sector: an observational study in Barcelona (Spain), 2008. Gac Sanit 2010;24:72–4. Grupo de Trabajo sobre Tabaquismo de la Sociedad Española de Epidemiología. Evaluación del impacto de la ley de medidas sanitarias frente al tabaquismo. Madrid: Ministerio de Sanidad y Políticas Sociales, 2009. http://www.seepidemiologia.es/monografia.pdf (accessed 17 Nov 2011).
. Regional President, Western Europe region. Press Release. Altria Group Inc., 23 Feb 2005. http://www.altria.com (accessed 17 Apr 2005). Project Star 2010 Results. KPMG, 2011. http://www.pmi.com/eng/tobacco_regulation/illicit_trade/documents/Project_Star_2010_Results.pdf (accessed 20 Jan 2012).
. Cigarette consumption in The Netherlands 1970-1995. Does tax policy encourage the use of hand-rolling tobacco? Eur J Public Health 1999;10:214–19. Canadian Coalition for Action on Tobacco. A Win-Win: Enhancing Public Health and Public Revenue 2004. http://www.smoke-free.ca/pdf_1/2004taxreport.pdf (accessed 18 Nov 2011).
. Tobacco Industry Influence in the Czech Republic: Manipulating Tax And Tobacco Advertising Policies. Mimeo: Department for Health, University of Bath, 2012. Funding This work was supported by Ministerio de Educación grant ECO2008-06395-C05-04, by Fundación Séneca grant 08646/PHCS/08, Instituto de Salud Carlos III grant RTICC RD06/0020/0089 and Departament de Universitats i Recerca grant 2009SGR192.